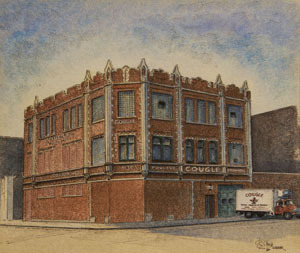 Cougle Commission Company started its proud tradition in 1873 when four brothers from the Cougle family opened the Company's doors for the first time on the Old South Water Street in Chicago. In 1900 Louis E. Freidheim, the grandfather of the current president, joined the Company as its bookkeeper and correspondent. In 1925 the thriving business had outgrown its original facility and moved to Randolph Street, which was at that time the wholesale center of Chicago for fresh fruit, vegetables and other groceries. Edgar Freidheim, Louis's son, joined the Company in 1931 following the untimely death of his father. Despite his young age, Edgar quickly rose to become a member of senior management. The last of the four founding Cougle brothers died in 1928, but several remaining Cougle heirs continued to hold an interest in the business until 1945. It was at this point that Elizabeth Freidheim, Louis's widow and Edgar's mother, bought the remaining Cougle shares not already owned by other members of the Freidheim family. Upon Elizabeth's death in 1959, Edgar was finally able to gain full control of the business, as he inherited his mother's ownership stake and purchased other shares owned by his siblings. Until 1938, the Company operated on a farmers' and commission basis, handling direct shipments of live and dressed poultry, veal, pork, vegetables and eggs with distribution to local operators and distributors throughout the Chicagoland area. This produce was shipped to Cougle by rail and boat—and later, by truck—from farmers and small produce dealers throughout the Midwest. Realizing its specialty and expertise lay in poultry, Cougle became primarily a further processor of poultry, focusing on the individual needs of each specific customer. It was at this time in 1938 that Cougle adopted its current logo—a spread-eagle chicken with a big "C" on its breast and two more subtle "C's" forming the wings to denote the initials for Cougle Commission Company. The third generation of Freidheims began to join the family business in the late 1960s as the Company experienced a period of rapid growth while expanding into red meat and other beef products. John Freidheim, the youngest son of Edgar, was the first member of the third generation to join Cougle on a full-time basis, and he served as Cougle's Vice President and Secretary for the next several decades. Shortly after John's arrival at Cougle, Lee Freidheim, Edgar's eldest son, also joined the business. There was a brief period in the late 1960s and early 1970s when Edgar's wife, Helen, worked at Cougle, ensuring that the business ran smoothly while her sons learned the business from the ground up. As time passed and the business continued to grow, it became apparent that Cougle's existing multi-story facility at the corner of May and Randolph Streets was no longer adequate. Toward the late 1970s, management began to search for a new site for the development of a modern plant. An ideal location became available adjacent to the Metra tracks a half-block north of Fulton Market, and in 1980, Cougle moved its operation into a newly-built facility there at the corner of Aberdeen and Carroll Streets. Oddly enough, Cougle financed the construction of this facility with an industrial revenue bond, the first of its kind to be issued in the City of Chicago. 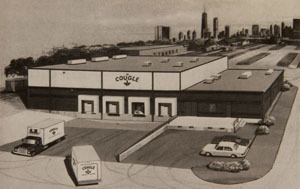 Cougle expanded the footprint of the plant's structure just five years after completing the initial construction, and the Company continues to operate at this location in the West Loop of Chicago to this day. In April 1994, after a Cougle career that spanned over 60 years, Edgar Freidheim passed away, leaving behind a legacy that is the envy of many in the industry. When Edgar first started at Cougle, he had just completed his undergraduate degree at the University of Chicago when his father, Louis, died suddenly. Instead of attending Harvard Business School, as he was initially slated to do upon graduating, Edgar was thrust into his father's position at a food business struggling to survive the Great Depression. 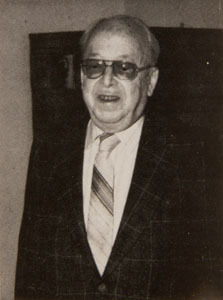 With his trademark no-nonsense style and business acumen, Edgar not only guided the Company through some of the most difficult economic conditions in modern memory, but he grew the business, bought out the remaining shareholders from both the Cougle and Freidheim families, and constantly sought out larger, more modern facilities that could handle his growing enterprise. By the mid-1980s, Edgar eventually handed over the day-to-day operations to his two sons, but he continued to make his presence felt, making his daily trip in from the western suburbs to check on the operation right up until several months before his death. Today, under the leadership of the Company's current president, Lee Freidheim, Cougle processes in excess of 500,000 pounds of poultry product per week in its USDA-inspected plant. The Company also serves some of the finest hotels, restaurants, institutions, distributors and value-added processors on a local and regional level. Having been in business for over 145 years, Cougle understands the needs and desires of today's customers. With the recent additions of the next generation of Freidheim family members to the Cougle team—Lee's children, Ed and Alison—the Company will continue this tradition of supplying quality poultry products to its customers well into the future.